Gandhi stood for a non-violent way of life. In our lives, we find the extraordinary in the ordinary. When we look around us and inside ourselves, we can find God in many forms. We discover and journey along a spiritual path through relationships with others, the world we live in, and ourselves. When we are mindful and attentive to what those mean, we find love in the world. Posted in Community, Leadership, Progressive Education, Reflective Moments, teacher as transformer, Uncategorized and tagged community, eloquent questions, Gandhi, Mindful Practice, mindfulness, servant-leadership, spirituality, teacher as transformer. Bookmark the permalink. Day of the Imprisoned Writer: a letter to Mahvash Sabet. We have many people around the world who are imprisoned for their political and religious beliefs. Usually, I find when we put a face on those that are somehow different they become real and human. It is important to reach out and take the hand of those who suffer persecution at the hands of others regardless of the reasons. It is important to make people real and human. When I did my undergraduate work, I was able to take one special education course. In the course, a point that was made several times and stuck with me was that we are more alike despite obvious differences than we are different. It is overwhelmingly so. Do we need science to tell us the obvious? Or, can we see the humanity that lies beneath the differences we want to see? Posted in Community, Education, Mindful Life, Progressive Education, Reflective Moments, Social Justice, Uncategorized and tagged community, conversational journey, creativity, eloquent questions, Mindful Practice, mindfulness, spirituality, teacher as transformer. Bookmark the permalink. It is an issue of private shame. The link is not to a poem, but rather to a series of quotes about hunger and the personal shame that comes with it. Politicians use hunger and other social justice issues as talking points and not seeing it as a matter of private and public shame in countries such as Canada and the US with their wealth. On the left, we have politicians who would subscribe to giving people something. On the right, politicians would blame those who go hungry including the children. Giving people a hand up is important and walking with them is a part of the longer journey. Solving issues such as hunger is community work. It takes neighbours helping each other in those moments of need. Regardless of what we have, we share. Wouldn’t that be a powerful learning in our schools. Posted in Community, Education, Leadership, Mindful Life, Progressive Education, Reflective Moments, Social Justice and tagged community, creativity, Educational Leadership, Leadership. Servant-Leadership, Mindful Practice, mindfulness, school, stewardship, teacher as transformer. Bookmark the permalink. I will change my routine week and post less often. I need to work on my dissertation topic. I want to enroll in the proposal seminar in June. If not, it will be next fall. I need to begin to set the table for the next part of life’s journey. is more real and reality is less real than it looks. is not the last word. than the realists want us to believe. must live from each other. Suffering without hope produces resentment and despair. even though we who plant them will never eat them. That is the secret discipline. and is a struggled commitment to the future of our grandchildren. the courage to die for the future they envisage. They make their own bodies the seed of their highest hopes. Posted in Education, Mindful Life, Poetry, Progressive Education, Reflective Moments, Sabbath, Uncategorized and tagged education, eloquent questions, hopeful work, Margaret Mead, Mindful Practice, poetry, Rubin Alves, school, teacher as transformer, Tomorrow's Child. Bookmark the permalink. Yesterday, I read a haiku written by someone who appeared to not enjoy writing haiku. Despite this, the person wrote an interesting, amusing, and thought-provoking poem. And here I write seven more! The person who presented this poem indicated that despite having written haiku they were unsure why teachers wanted them written. I think there are good reasons, but I could be wrong. 1. Poetry calls for the best possible word choices. Most poetry is simultaneously spare and spacious. The spareness is in the number of words; the fewer the better. The space allows the reader room for interpretation. What did the poet mean? What senses are invoked through the word choice. A jungle of meaning revealed. 2. Students learn about figures of speech and their importance in expressing what we want to say. We can compare unlike things and make sense of a complex world. 3. I tell students who struggle with reading and writing poetry is an alternative way of expressing themselves. I use ee cummings as a model so they overcome their worries about grammar, spelling, and capitalization. 4. I enjoy poetry. I always have. I remember a poem, The Elevator, I memorized in Grade 4. I think it Walter de la Mare wrote it. My friend memorized a poem called Douglas Fir, because his name was Douglas. What my enjoyment means, is I bring enthusiasm to the process. I believe we need to tell students what they are learning and the reasons they are important. But, then it might just be me. Posted in Education, Haiku, Lesson Plans, Progressive Education, Reflective Moments, Writing and tagged blogging, creativity, education, haiku, Progressive Education, reading and writing poetry, teacher as transformer. Bookmark the permalink. I mentioned this book in Culture of Peace and Angry Young Poet. It was worth a read. I start with a haiku which emerged from the book. I read Tuned In and Fired Up by Sam Intrator for two reasons: as a teacher and as a graduate student preparing for the dissertation process. Sam contributes to the work of the Centre for Courage and Renewal which based on Parker Palmer’s writings and thinking. The book is enjoyable, informative, and motivating. Teachers need to take time and pause, reflect upon, and recall the reasons they were called to teaching. There are alchemical moments of discovery we artfully use and define teacher, students, and subject. It is surreal and its magic can never be underestimated as the three blends into a single whole and respects individual integrity. Part of the magic in this book is Mr. Quinn, the teacher. He took risks and students tuned in and fired up to his genuine presence. 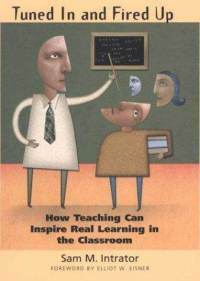 Parker Palmer, in The Courage to Teach, suggested “teaching is always done at the most dangerous intersection of personal and private life” (p. 18). Mr. Quinn’s teaching was learning and realized he could wrong. The magical aspect takes a teacher onto the boundary and, then, into uncharted waters. Good teachers take that risk and students sense it. Towards the end Sam cited William Ayers: “Since teaching is always a search for better teaching, I am still in a fundamental sense becoming a teacher. I am stretching, searching, and reaching toward teaching” (p. 134). This is a virtuous cycle of learning-teaching-learning to infinity. Sam leaves the reader with an incredible list of those things teachers can reflect upon and use according to their setting. Many are well-known: cultivate rapport with students, compete tenaciously for their attention, and spark their desire to create. Others were ones I felt were lesser known: embrace your role as a performer, tap into their senses, and acknowledge boring. That last one is challenging. At the adolescent level, treat them like they are becoming adults. Questions: A concern expressed by Sam was a need for genuine collaboration. What practices do you use in your workplace or learning that foster collaboration between adults? If you teach, what ways do you include students? Recommendation: I loved the book and let me leave you with just two ways. It was easy to read without losing meaning. Sam used simplexity and achieved his aims. Second, he left a thorough recipe without the quantities. I need to figure those out with students and subject. Intrator, S. M. (2003). Tune in and fired up: How teaching can inspire real learning in the classroom. New Haven, CT: Yale University Press. Palmer, P. J. (2007). The courage to teach: Exploring the inner landscape of a teacher’s life. San Francisco: Jossey-Bass. Posted in Education, Haiku, Progressive Education, Uncategorized, Writing and tagged education, Educational Leadership, haiku, Parker Palmer, poetry, Progressive Education, Sam Intrator, teacher as transformer. Bookmark the permalink. Each year, I spend time on poetry with the students. Two years ago, a student asked if I wrote poetry in junior high school and I was able to say, “Yes!”. He asked me to share with them. I found them in a small lock box I keep at home and shared several with the class. I mentioned in Culture of Peace Sam Intrator. He suggested teachers expose adolescent students complex, existential questions of life as they move through those formative years. I wrote my poems in about 1969. It was a time when identity was increasingly rooted in the global nature of the world, not just immediate community and family. War, even in Canada, entered our homes via television. I found voice in poetry and expressed an abhorrence to institutional and government approved murder. What set me apart from my peers, was I took no sides. Each was equally wrong in my mind. Mr. McKenzie, an innovative English teacher, encouraged that in us-find our voices. I shared the following poem with my students. I concede it is not exactly the original, as it was pretty angry. I hope the original message is still there. Students asked for more poems and I complied. These past few months I rediscovered my poet’s voice. It is a gentler voice, I hope. Win or Lose: What Difference Does it Make? No great thing to win. Each, vanquished in every sense. But see an enemy vanquished. Take care and have a great 20th of July, 2012. Posted in Education, Lesson Plans, Mindful Life, Poetry, Progressive Education, Reflective Moments, Uncategorized and tagged adolescent students, education, literature, mindfulness, poetry, Progressive Education, Sam Intrator, war. Bookmark the permalink.